SUNDAY POST ~ It has been raining most the day in MA. So I have a rainy day photo for Post Cards from Paradise and Your Sunday Best. 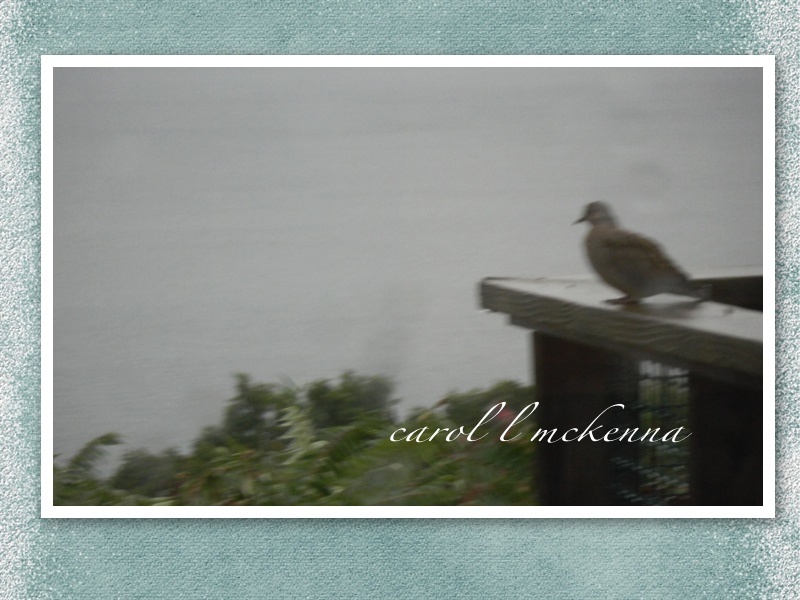 This little Morning Dove was perched on my deck for the longest time. When this happens, I feel it is the Universe sending me a message from 'Beyond'. Grateful. The First Photo is a collection of pen brush sketches. All of them were done with a Pentel Pen from Japan. The first sketch is experimenting with sketching pagodas and flowers and exploring ways to put art and haiku together. The other one is a collection of strange and weird faces. The final one is exploring a goddess or icon image. Rainy days and Sundays can get one down ~ Yet, although we have not been able to get out for our daily walk; we have been rather busy with art, blogging and 'house stuff' ~ You know that 'house stuff' that is always there? ~ Since I don't have a maid. Do you have a maid or cleaning lady? ArtMuseDog is beside herself and needing more attention from me because we can't go for our daily constitutional. Guess, we will have to walk down the hill, get the mail and get wet! the dove don´t seem happy about the rain. The shot shows it. Have a wonderful rest of the weekend. I'm listening to Rainy Days and Mondays. That poor girl died so young! I like how you've hung your sketches with clothespins. I love the close line, so cute and creative. We send ourselves post cards, when we are on vacation. I am going to hang them all, just like this, so they are out and I can always see them!! Hi Carol, thanks for stopping by today and good to see you again. It is raining here as well along the Atlantic coast of Nova Scotia. Sophie, our dog, got her walk in, in between showers. Rain gear, as you probably know where you live, is an essential in this neck of the woods, this time of year. I liked what you did with the two photos. I know I need to learn about textures and their use. The dove I believe was sent so that you could 'record' this quiet, lovely scene. It's all about the energy that surrounds us I feel that attracts other living creatures. Have a great weekend and I hope you get a break in the weather....that means we will too!! Interesting wet dove photo. I also like the way you have used clothes pins to hang the drawings. Thanks for visiting my blog, leaving a comment, and becoming a follower. Hope to see you back often. We've had plenty of rain today, too. Love the photo of the mourning dove... And the way you pinned up your sketches like that! 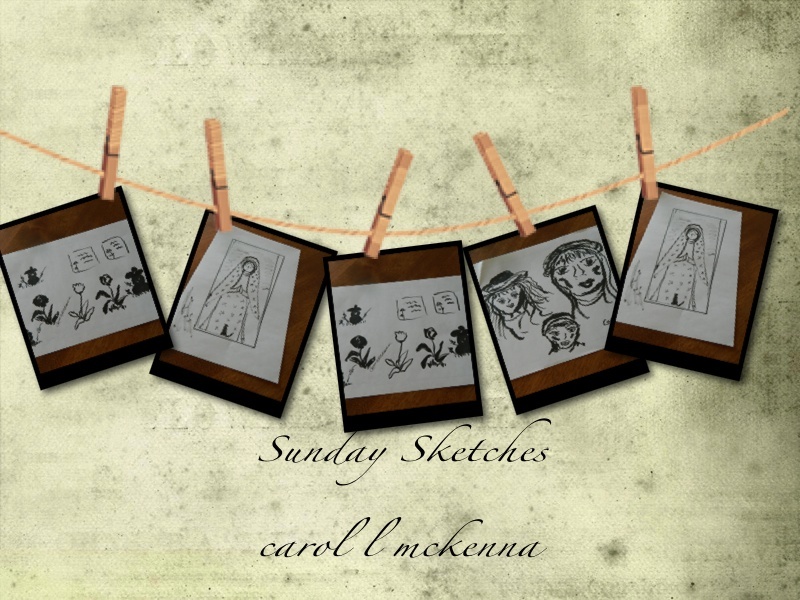 lovely to see each of your sketches and your rainy day photograph. Love the clothes line with your sketches, great idea, really love the photo of the dove. I love doves. They come to our garden every now and again too. They are very graceful beautiful birds and we are lucky when they come to visit. Thanks for dropping by. great to see how you arranged the art. i agree, sometimes rainy weekends can be lonely and a tad depressing....sounds like you made the best of it through art! hopefully the sun will shine today! Oh I can relate to what you're experiencing. Haven't seen the sun in far too long just north of you. Delightful sketches & that photo captures the past few days beautifully. I love seeing your sketches displayed this way. Enjoy your rainy Sunday. It's raining here today, too, but it's a welcomed thing after our long drought. And, with the rain often comes rainbows! Of course, our farmers don't like the rain! They want to be in the field! Love your photos! Hope the sun pops out on you soon! Oh I love your first photo! That poor dove looks so soggy. Love anything with clothespins! Cute! I'll take some of that rain, please! Hi Carol!!!! love the drawings and the way you presented them!!! what a lovely collection of little sketches! Have a fun Sunday, even with the rain! The rain sounds so delightful. How nice. Love the little pen pictures...perfect to brighten a cloudy, rainy day! No maid or cleaning lady here either. Love your cute photo of the bird in the rain. I do not have a maid but I do have teens. ;-) What fun sketches and with a pentel pen from Japan, how cool! I love those special messages like doves perched in the rain. Glad you and art muse are keeping busy during the rainy Sunday, have a great week! I like your sketches as clothes on a clothes line. That looks adorable! and swooning over that Joni Mitchell line. I have been enjoying your photos along with your sketches. I like the clothes line effect of sharing your sketches. I love mourning doves, their sound is amazing. Your clothes line is adorable!